Stanley is known for its panoramic views of the ocean and alfresco eateries along the boardwalk but not necessarily for its authentic Chinese cuisine. 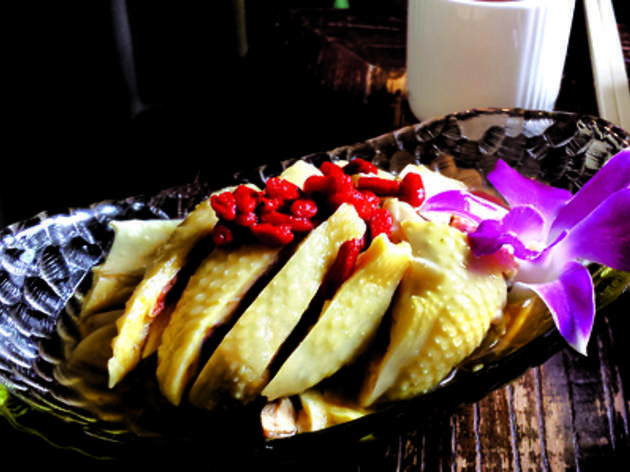 However, tucked away in the bend of Stanley Main Street, serving up specialty Guangdong fare, is the new 80 Restaurant, hoping to change the reputation. Unlike many maritime-themed restaurants in the area, the décor at 80 transports us back to 1960s Hong Kong, with robust rosewood tables, chairs and low lighting that is only broken by the natural sunlight streaming though the high windows. Behind the paned folding doors at the back is a small courtyard which leads to the kitchens, a space very reminiscent of traditional Chinese architecture. 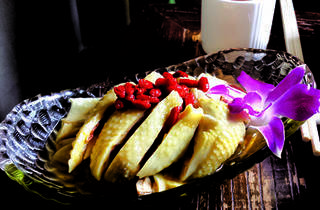 We stick to the traditional theme and go for their signature dishes of drunken chicken in 21 year old Chinese sweet wine ($78) and sweet and sour pork ($98). The chicken skin is smooth and has a layer of gelatinous fat which soaks up the aromatic alcohol. We can taste a fragrant osmanthus flavour, bringing a new twist to this tried and true local favourite. Good cuts are used in the sweet and sour pork that aren’t too fat or lean, allowing for a good clean bite. The crispy batter encasing the pork has an impeccable consistency that clings to the sauce without becoming too soggy. The same batter doesn’t hold for the crispy squid in golden garlic pepper ($148), however, as it falls apart on contact, but it is well-seasoned nonetheless. We sweeten the meal with apple in hot toffee ($58) – full of great crunch and a rounded apple flavour. 80 Restaurant Shop A2, G/F, Villa Fiorelli, 80 Stanley Main St, Stanley, 2217 6168; facebook.com/80eighty. Daily 11am-11pm. Dinner for two: around $400.